Episode 3 of Season 11 will be a recap of the Steelers draft. This should be fun. P.S. : If you like the show, please go to steelerfurypodcast.com and look for the Paypal donate button on the lower left side. Even a buck or two helps a lot, thanks! Also, apologizes to anyone who previously tried to donate to the show-- the Paypal button linked to the wrong address, so that's why it was returned. IF YOU'D LIKE TO ASK A QUESTION OR MAKE A COMMENT ON THE AIR, let me know in the chat box on Uberconference! Something special to ask this year: If you like the podcast, please take a few minutes to post a review/rating at either iTunes or soundcloud. We need at least 10 reviews at each to get bumped up in the listings, which would help us keep going. Thanks! Apologies for some less-than-ideal audio quality, but it's a good show. If you bookmark that page, it updates every time there's a new episode. Nice job fellas. I will say the first time in years they had Pats on the ropes and but for a dodgy catch rule would've beaten them: Shazier wasn't on the field. Remember when JJ Wilcox was gonna be Sean Davis' replacement? Great pod. Was expecting the hate to flow and was surprised by how relatively postive it was, which was nice. We’ll see if the Steelers sacrificed immediate success or not with this class, and as someone who generally tries to remain positive, even I have my concerns with this group. Great Podcast guys. Good takes on every draft pick. Next time, I'd like to hear your take on every UDFA, since every year we find a Mike Hilton or Foster. I like Franklin. I think he's a little quicker than he seems, especially if he loses a few pounds like Bell did. Hey, Terrell Edmunds has a SPARQ above the 97th percentile at the Safety position. That isn't the be all-end all, but at least they have a great athlete they're training and banking on. My main issue with him is that he's not as good a player as he is athlete. Regardless, I still had him as the 5th best safety- as is. No one saw three offensive picks in a row happening, but they seem like solid choices. Chuks isn't a great athlete, but he's huge and has some skills. Washington has some very good traits, including contested catch skills & ball-tracking that few Steelers WRs have had during Ben's tenure. 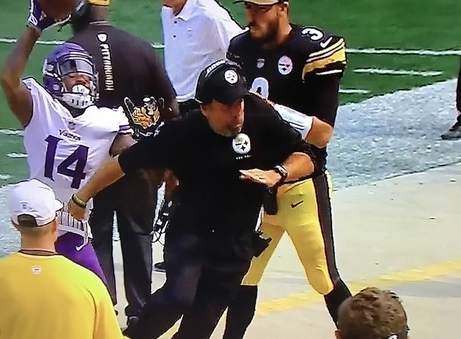 Considering how much success Ben had throwing deep balls to horrendous ball-trackers/contested catchers like Bryant and Mike Wallace, I look forward to see him work with Ben. Rudolph's floor is: better backup than Landry. My biggest fear is that he will peak at average starting QB and be an obstacle to losing enough to get a superior QB. But, that's a long way off. I love Jaylen Samuels and it's possible Marcus Allen and Frazier will be better than expected. Porbably going to like this draft more in 3 years than I do now. Rudolph is questionable with our championship window, but you can't dispute the value. The pick I still can't get over is Chuks. I won't be a believer in Chuks until he REALLY proves something. Profiles too similar to Big Dan. Also I fear it means Hawkins is a wasted pick to go along with Dobbs. Just hope Big Ben can put aside his differences with the Mason Rudolph pick and groom the kid into the QB he is. Doesn't sound like Ben has any problems with helping Rudolph. I do think you guys are correct in that Marcus Allen is a ST pick. I just do not see a place for him on the Steelers. If I squint really hard... he's very young and might be a little smaller than his current playing weight. Perhaps he works as a Telvin Smith type rover. He's comparable to Telvin's size/athleticism/style. This is not aimed at you, b2b. Is it Ben's job to groom Rudolph? It appears to me that way too much is being made of this. We should have a dedicated qb coach to help Rudolph. 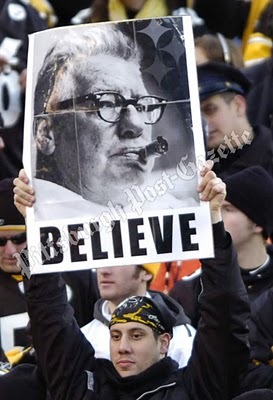 I want Ben focused on getting Lombardi #7 and in general being a team leader which would include some tips to Rudolph. But Rudolph learning from Ben will be more Rudolph observing than anything else most likely. It's on Rudolph to sink or swim with the help of the coaching staff and maybe the help of the #2 qb (Landry). It appears to me to be silly to think this falls on the starting qb. Some guys are natural teachers and enjoy teaching but many are not and do not excel at it. So if you hear about player x compared to player y in this regard... might not be a fair comparison. It is indeed much ado about nothing. It's a Steelers town, the Pens are out of the playoffs, the city isn't going to trust the Pirates enough to invest emotionally for a while yet, so there really isn't much else to talk about. I read that BR said it's traditionally the #2's job to groom #3 (Even if he's going to take your job. Eventually). He said Landry knows the system, is smart, and is as good a teacher as any.